For the 2005 season, a record 19 grands prix would be contested and Ferrari's five years of dominance would be tested by a shake-up in the regulations. A new rule prohibited tyre changes during the course of a race and engines were now required to last two rounds without being changed. During pre-season testing, Renault emerged as early favourites and so it transpired as they dominated the early fly-away rounds. The supremely talented but enigmatic Giancarlo Fisichella won the season opener in Australia and many F1 experts predicted a titanic battle between the Italian and his young Spanish team-mate, Fernando Alonso. Alas, the contest many craved for ever transpired as Alonso demonstrated his title credentials with back-to-back victories in Malaysia, Bahrain and San Marino. Reigning world champion Michael Schumacher struggled in the early rounds, following up a retirement in Australia with seventh in Malaysia and a further retirement in Bahrain. After a disastrous qualifying session in San Marino, the German recovered from 14th to press Alonso in the closing stages to kick-start his season. But Alonso's main challenge would not come from the Ferrari of Schumacher but the McLaren of Kimi Raikkonen, which was considered by many as the faster package. Raikkonen won from Alonso in Spain before dominating the Monaco Grand Prix from pole position as Alonso finished fourth. Raikkonen then fell foul of the new tyre change rules in spectacular fashion while leading the European Grand Prix at the Nurburgring, his suspension collapsing due to vibrations caused by a flat-spotted tyre only laps from the chequered flag, causing a dramatic accident and handing the win to rival Alonso with victory in sight. The McLaren driver put the disappointment of the Nurburgring behind him in Canada by getting back to winning ways as Alonso retired after damaging his suspension following an uncharacteristic mistake. Michelin withdrew from the US Grand Prix on safety grounds, leading to a farcical race with only the six Bridgestone runners competing. It meant that Alonso held a 12-point lead going into the French Grand Prix and he extended his advantage with victory from Raikkonen at Magny-Cours. Second and first place finishes in Great Britain and Germany respectively left the Spaniard within touching distance of his first ever world title, but Raikkonen was not going to give in that easily. Wins in Hungary, Turkey and Belgium piled on the pressure but a third place finish for Alonso in Brazil netted him the title with two races to spare. Although both he and Raikkonen had six victories to their name at this point, Alonso's greater reliability over the season proved decisive. Alonso's success made him the youngest champion in the history of the sport, a title he held until Lewis Hamilton's 2008 title success. The Japanese Grand Prix provided one of the most memorable races of the season as Raikkonen recovered from 17th on the grid to charge through the field and overtake Fisichella for victory on the final lap. The race aso provided one of the season's best overtaking manoeuvre's when Alonso overtook Schumacher around the outside of the famous 130R. 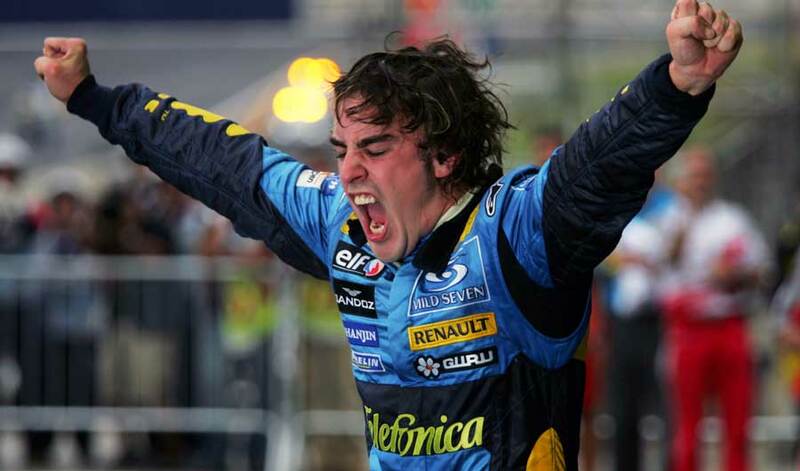 Renault's first constructors' championship was secured in the final race in China with Alonso's seventh race victory. The 2005 season was the last for several well known teams, with Sauber, Minardi, BAR and Jordan all being taken over by new owners.